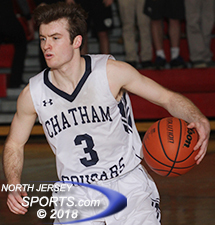 Jack Rooney made all 6 of his fourth quarter free throws and Chatham made 19 of its 21 attempts overall in a 45-34 win over NV/Demarest in the Group 3 semifinals on Friday night. EAST ORANGE – Northern Valley/Demarest was up against its mirror image in Friday night’s Group 3 state semifinal. Like the Norsemen, Chatham is a team comfortable in its deliberate offensive scheme and willing to let long possessions happen rather than take rushed shots at the first opportunity. So when Chatham nudged in front by multiple possessions with a 7-0 run spanning the third and fourth quarters, it was going to be hard for Demarest to make up the ground. So the Norsemen saw their season, one of the best in program history, come to an end on the short side of a 45-34 verdict at East Orange Campus High School on Friday night. It started out all right for both teams as the first five field goals made in the game were all from the behind the three-point line. It was a hot-shooting first eight minutes for both teams as they combined for seven made three-pointers in a first quarter that ended with Chatham in front 17-11. And then things slowed to a crawl, offensively at least. Jake Runyon finished with 9 points for Demarest, which closed the season with 24 wins, a school record. Even though Ryan Doherty’s third opportunity from the baseline accounted for the Cougars’ only points of the second period, they never game up the lead and held a 19-17 edge at the break. 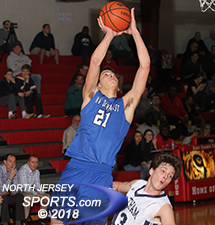 The teams combined for only 20 points total through the middle two quarters with Demarest able to edge in front twice in the third, both times after Connor Scaglione baskets that put the Norsemen in front 20-19 and 22-21. Chatham responded with a conventional three-point play by Jack Rooney and step-in jumper by Doherty to go back in front and kick off the decisive 14-2 run that tipped the game in its favor for good. The lead swelled to as many 11 three times in the fourth quarter and to as many as 12 at 42-30 with 59 seconds left in the game after an EJ Leskauskas free throw. Demarest could just never get it rolling as Chatham made its free throws. The Cougars were 19 of 21 from the line in the game, 18 of 21 in the second half and 15 of 17 in the fourth quarter. Mac Bredahl and Chatham are heading to the Group 3 state final where they will play Nottingham on Sunday at Rutgers. Chatham’s accuracy from the free throw line left little room for a comeback for Demarest as it closed its season with a 24-6 record and having won just the second state sectional title in the history of the boys basketball program earlier this week. It was quite a run for this group of eight seniors – Scaglione, Zach Stimmel, Joe Rotonde, Austin Albericci, Jake Runyon, Endrit Kaleci, Andrew Fullin and Drew Davis – that rebuilt the Demarest program. The Norsemen started 0-7 last season and ended this year as one of just 12 teams in the state left playing this late in the year. It’s been a great run for Chatham, too, as the Cougars are heading back to the state finals for the first time since winning the Group 2 title back in 2007. Chatham got 15 points apiece from Rooney and Berdahl, 9 from Doherty and 5 from Chris Loniin as it improved to 26-5 heading into Sunday’s Group 3 state final against Nottingham. 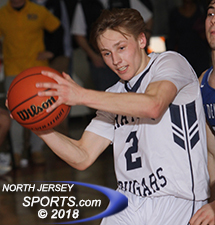 No Demarest player finished in double figures as Runyon topped the list with 9. Scaglione and Rotonde each finished with 6, Stimmel, who battled foul trouble early in the game, added 5 points, Albericci made a three-pointer and Kaleci made a field goal for the Norseman, who got 31 of their 34 points from the outgoing senior class. Nick Argenziano had the other three points for Demarest.